The “*.vmsn” file is a copy of the point-in-time memory contents for the VM. This file will be as large as the vRAM assigned to the VM – so if you have a 4 GB virtual machine, then the memory snapshot file will be 4 GB as well (provided there are no memory reservations in place). The “delta.vmdk” file is essentially a new virtual hard drive for the virtual machine. Any new data that is written to the server will be written to this file. This can grow very large, and it is not a best practice to leave snapshots on VMs for any extended period of time. To validate this, I copied a series of files onto the virtual hard disk of a VM, and then compared the sizes of the snapshot delta files each step of the way. The snapshot delta file is 16 MB. The snapshot delta file is now 128 MB. 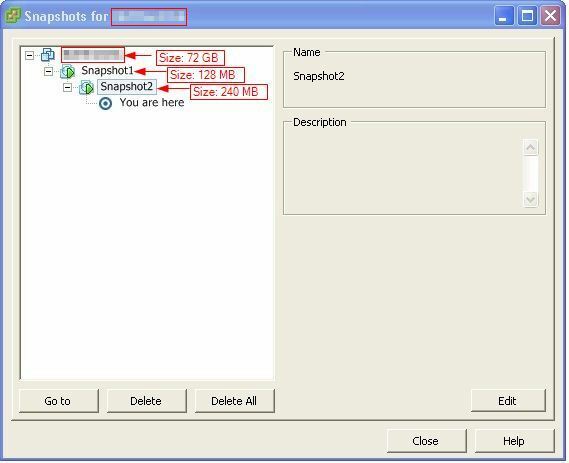 The first snapshot file is unchanged. The second snapshot file is 16 MB. The first snapshot file is unchanged, even after writing new data to the VM. The second snapshot file is now 240 MB. 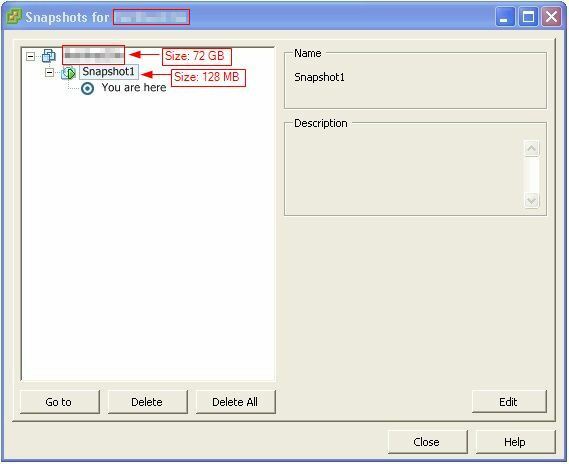 If you have multiple nested snapshots, earlier snapshot delta files will not be written to. It is a best practice to delete snapshots shortly after they serve their purpose – they can grow to a very large size, and quickly become unmanageable. This entry was posted on October 7, 2012, 12:18 pm and is filed under VMware. You can follow any responses to this entry through RSS 2.0. You can leave a response, or trackback from your own site.